Fight day is getting closer. In just over three weeks Marco Huck (38-2-1, 26 KOs) will step into the ring for the 42nd time during his professional career. August 14 will see the reigning WBOSuperChampion take on mandatory challenger Krzysztof Glowacki (24-0, 15 KOs). As the big day at the Prudential Center in Newark, New Jersey is just around the corner the 30 year old German has been training intensely for the past 4 weeks. But Huck took some time out of his busy schedule to give his thoughts on his US debut, new coach Don House and a record breaking 14th defense of the Cruiserweight title. Marco Huck, you have been in training camp since June 25. How has it been going so far? Marco Huck:I have to admit that the heat was pretty draining to begin with. I caught myself wondering if this would end well for me. But after three days my body started adjusting to the extreme conditions and it became clear that the surroundings are benefiting my training. If I can manage to get through this I can get through anything. What are the differences between your previous camps in Kienbaum, Germany and your current one in Las Vegas? Marco Huck:The name itself says pretty much everything. Everybody no matter if they have been here or not will recognize that there is a huge difference. Kienbaum is a very secluded place with not much to do apart from training. But obviously it was the right thing to do at the time. My record is proof of that. Las Vegas is a whole different story. The city is full of activities outside the training schedule. But of course my mind is fully focused on my goal ahead. I appreciate my current situation and am doing everythingrequired to succeed. Another new part of this training camp is your coach, Don House. How do you two get a long? What kind of person is he? Marco Huck:Don House and I get along great and we work together really well. He trusts me and gives me space to breath but at the same time he demands a lot during our training sessions. My former coach Ulli Wegner was very different. I had less freedom and he often had a go at me in a “humorous” threatening way. Sometimes I even hid from him. With Don it’s a different story. The space he allows me to have also means that I have more responsibilities. I am now training and boxing for myself. I need to prove that my decision to go it alone was the right one and put my words into actions. You mentioned your former coach. What does your relationship with him look like now? Marco Huck:I have always said that Ulli Wegner is and was a father figure to me. He took me on as an amateur and recognized my potential immediately. Not a lot of people would have taken that risk. It proves that he is not just an amazing coach but also a great person. A telephone conversation with him can still motivate me. Ofcourse I was very surprised about his latest comments, but nevertheless I only have good things to say about him and wish him all the best for his future. Your fight against Krzysztof Glowackiis in all points a significant one. It is your first fight without Sauerland and the first fight in the US. Your first fight under Don House and a potential record breaking 14th title defense. Are these aspects more motivation or pressure? Marco Huck:They’re motivation and pressure at the same time. Expectations are obviously high and a lot of people believe that it will not work without the influence of Wegner. But I know that I am a pro and I will combine the things I have learned in the past with what I am picking up now. The fact that I am fighting in America is extremely motivating. I always wanted to make it here and conquer the US. The fans over here want to be entertained. The best example was Klitschkos’ fight in New York. He bored the viewers. I will show them how exciting my style is. To break a record with title defense number 14 on my US debut is the icing on the cake. With a victoryI will go down in boxing history after August 14. Why did you decide to fight in America? 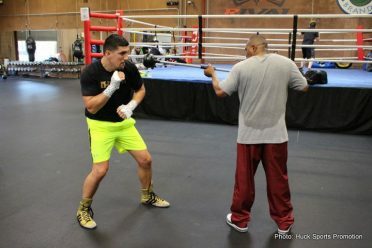 Marco Huck:The US has always been the place to be. The biggest names of the sport have fought here and every fighter who takes pride in himselfand wants to be a member of this illustrious circle has to step into the ring stateside and win the fans over. That has always been my ambition. What do you know about your opponent from Poland? How dangerous is he to your ambitions? Marco Huck:The only thing I know about him is that he is a southpaw. Apart from that I haven’t concerned myself with him too much, although I heard that he has been running his mouth lately. A lot of people have done that before him and they all came crashing back down. The same fate awaits Glowacki. What will be the outcome ofthe fight at the Prudential Center? Should the fans prepare themselves for a knockout? 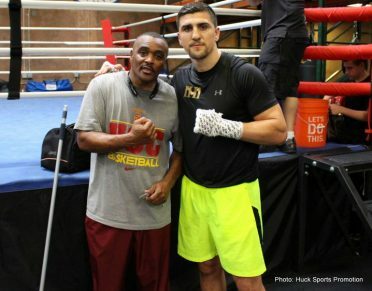 Marco Huck:The Americans should expect a real Huck-Show. Entertainment is guaranteed! Will the ten month layoff show? The preparations for Marco Huck’s (38-2-1, 26 KOs) upcoming bout are well and truly under way. 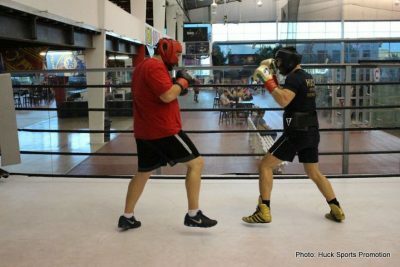 The reigning WBOSuperChampion has been in his Las Vegas based training camp since the end of June, in order to get in shape for the mandatory challenger Krzysztof Glowacki (24-0, 15 KOs). Huck will take on the Pole at the Prudential Center in Newark, New Jersey on August 14, almost a year after his last outing.